Sufferers of parcopresis, the inability to defecate for fear of privacy, can now budge their issues easier. Hotoa Industries of Quebec have released a new design of toilet bowl that will muffle the sound of falling faeces and the resulting sonics of the splash. The bowl uses a patented design involving a sophisticated set of baffles designed to disperse, muffle and reflect the sound of all goings-on within the bowl, resulting in a more private poop. Statistics show that more than one in ten people suffer from “toilet shyness”, a condition that can be exacerbated by echoing cubicles and toilets located close to high foot-traffic areas. As a result, Marius explains, people who have parcopresis often take a long time to finish their business, or hold on until they can return to the privacy of their own home. The resulting product, looking similar to a toilet with turbo-chargers attached, costs only a tenth more than a standard ceramic issue and can reduce the overall noise by thirteen decibels on average, depending on the posture of the patron. The company is expected to release the bowl to the market later this year and is already making plans to design a similar device that would retrofit existing bowls. Distracted drivers are not at fault, according to new research. The Robotic Automotive Administration yesterday announced that car manufacturers are responsible for the traffic and injuries caused by distracted drivers, not the drivers themselves. Vehicle technology, the report says, has improved in areas of efficiency and comfort, but it has failed to keep up with the trend of mobile phones and social media. The report goes on to cite the lack of a push from car manufacturers to develop automated cars. While it makes no absolute claims, it does imply that they have their own agenda for keeping people behind the wheel. Nature has inspired town planners in an unusual way. The hexagonal pattern of honey-comb is chosen by bees for the close-packed arrangement and efficient use of space and this has led city designers to create plans for blocks to be six sided. A new ‘hexasect’ street system is being trialed in China in a bid to curb traffic before it begins. The ‘hexasect’ design was first suggested over a decade ago, yet only recently, with the aid of advanced computer generated trials, it has been shown that congestion can be reduced by more than a quarter compared with traditional square or Cartesian based road systems. The new concept also allows for tighter packing of building, reducing the strain on infrastructure, leading to a more efficient city that is cheaper overall to operate. Author Chester PressPosted on October 1, 2015 October 12, 2015 Categories Chester Press, Strange NewsTags automated vehicles, Bee-Hive, Bee-hive city, Design, Hexagonal City Design, Hexagons, Strange News, Weird NewsLeave a comment on Bee-Gone, Traffic! 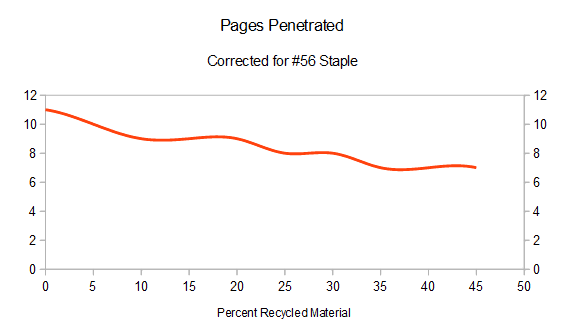 The properties of recycled paper is forcing staple manufacturers to rethink the archaic staple design. The rise in the percentage of recycled material in paper is blamed for the recent move to redesign the common staple to create ‘Super-Staples’. More recycled material amounts in a paper that it tougher than pure pulp, says Roger Tasco, leading Technical Expert at Sawmill Papers in Hampshire, England. Rather than forcing stationery users to upgrade their staplers to hold larger, stronger staples, Roger is behind a nationwide move compelling staple manufacturers to change the design of staples. But Roger is not content to stop there. He proposes that the archaic design of staples can be vastly improved, with ideas including angled barbs, fluted and channeled shafts, a beveled top edges.